So did your kitchen measure up over Christmas? If it isn’t well designed, or it’s just in need of an upgrade then now is the time to think about changing it as we have a fantastic offer in place for the New Year. This is worth over £700 trade value (so you would pay much more at retail cost). That’s fine too. If you don’t want the appliances we’ve selected, or already have your own, then we can reduce the cost of your kitchen by the equivalent value – that’s over £700 off the cost of your kitchen before you even start! Surely that’s got to appeal at this time of year? To take advantage of this offer you have to order your new kitchen from us before the end of January. To get started please book a consultation so we can start designing your dream kitchen! Contact usto make an appointment. Offer is only valid for orders placed (and initial deposit paid) before the end of January 2014. 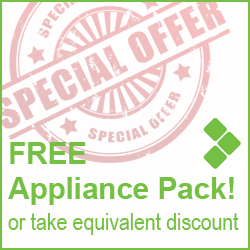 Appliances offered in free appliance pack relate to a range of specific appliance makes and models, available on request. Not valid in conjunction with any other offer. 0 Responses to "New Year – New Kitchen?"